I recently bought a cheap speakerset from TRUST, the sp-3100 (TRUST Soundforce 2.1 Speaker Set SP-3100). Giving the cheap stuff the sound isn’t that bad, but the gear had the nasty habit of playing radio channells when idle or on low volume, RFI in a word…. Unfortunately the set doesn’t provide a radio at all; it just picks some stray radio station and plays it in the background, at fixed volume. Today I decided to fix try to fix it, using some spare ferrites I had around. DISCLAIMER: Read the Disclaimer and Copyright. Don’t follow the steps outlined below if you aren’t a trained technician. Always disconnect the gear from main and discharge power capacitors before operating. The sp-3100 operates at main voltages thus providing dangerous voltages inside. Check for dangerous voltages before operating! I will not be responsible for damages incurring following the steps outlined! Update (24/11/08): I silenced them, and not by throwing them out of the window. Before opening I double check that the equipment is not connected to the mains in any way, of course. After that, I should take any care to discharge the capacitors inside the equipment! 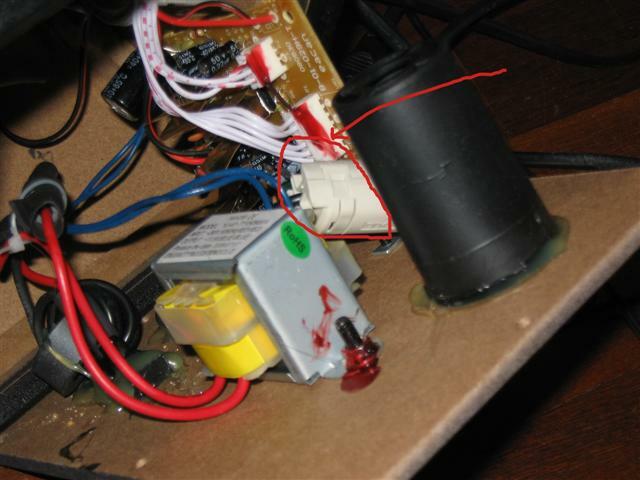 First tried to ground the pcb (no avail)… the box is wood and grounding and the plug is two prongs…even grounding the pcb won’t help . Then decided to use all my ferrites. I disconnect the speaker set from the mains and operate the proper discharge/check procedures to ensure I have no dangerous voltages around while operating. I will not cover this as one must be a trained technician to repair gear running on mains voltage. If you’re not, stop reading here. I open the main box, unscrewing the the screws along the border. I don’t unscrew nothing else. I put a ferrite around the audio input cable, as close as possible to the pcb. 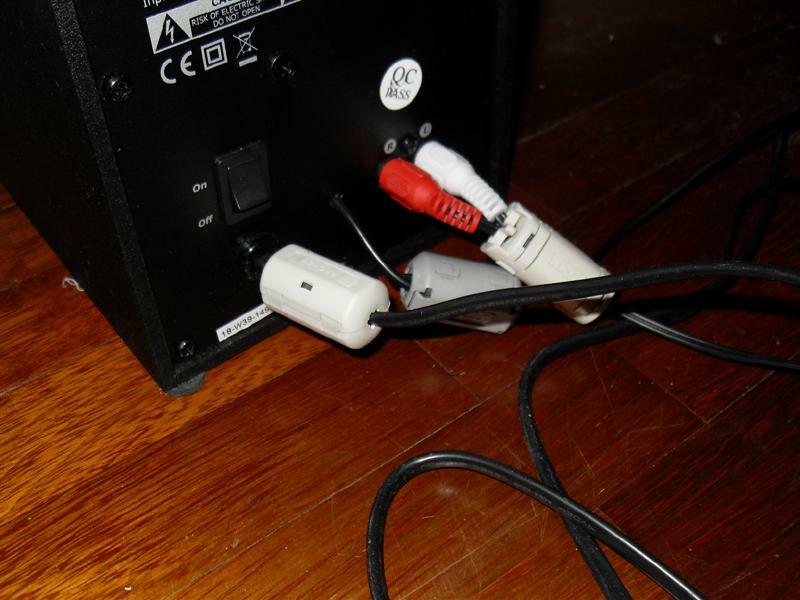 I put the other ferrite on the mains power cable, outside but as close as possible to the box. This one may be rendundant as there’s already some stock ferrite around the power cable inside the set. This solved the radio interference for me completely, although sometimes I still hear radio. The set is not completely silent when idle. premetto innanzi tutto che il fix non ha risolto completamente il problema ma lo ha solo attenutato. Quindi io stesso mi chiedo se ne valga effettivamente la pena. Dato che l’operazione comprende la necessita’ di operare all’interno delle casse, dove potrebbe esserci in girocorrente elettrica a tensione pericolosa anche con la spina scollegata dalla rete elettrica, personalmente ti sconsiglierei di effettuare questo intervento. Posso pero’ descrivere cosa ho fatto io in soldoni: mi sono procurato una i una di quelle ferriti coperte di plastica che si trovano in giro (ne danno spesso con le fotocopiatrici, coi televisori, ho visto anche qualche cavo usb di qualita’ che ne ha qualcuna attaccata, a volte qualcuna sui joypad, si dovrebbero trovare in giro nei negozi di elettronica), ho scollegato dalla rete e dalla sorgente audio le casse, ho atteso per un bel po’ di tempo per minimizzare la possibilita’ che all’interno dei condensatori dell’alimentatore vi fossero tensioni residue e ho aperto il contenitore delle casse. A questo punto ho applicato la ferrite (queste ferriti hanno un canale cavo all’interno per permettere il passaggio del cavo) attorno al cavo audio, il piu’ vicino possibile al PCB. A questo punto ho richiuso tutto. ciao ..mi sapresti dire gli ohm dei tweeter ?? grazie~! purtroppo li ho regalati diverso tempo fa!